After leaving Paiute Cave we found our way over to Nampaweap to explore the countless petroglyphs found all over the boulders and cliff faces in the area. Nampaweap means “foot canyon” in Paiute. This canyon may have been an important prehistoric travel corridor from the Grand Canyon to the resources of the ponderosa pine country around Mount Trumbull. 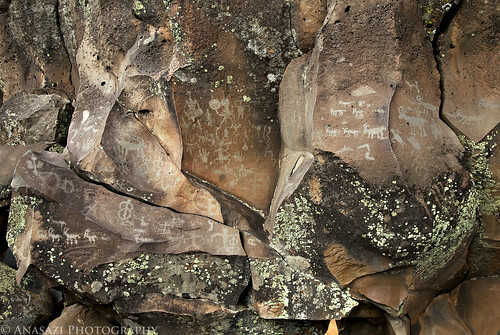 This is also one of the largest known rock art sites on the Arizona Strip. This photo shows a typical scene found at Nampaweap. There are plenty of boulders, petroglyphs and lichen in the area. We found a lot of petroglyphs on our visit, but I’m sure we probably missed many of them, too. This site will definitely require another visit or two when I have the chance.